We’re off for our second week of bliss on the Outer Banks of North Carolina. This time, we’ll be staying at a friend’s place in Nag’s Head. It’s been a while since I first stayed in Nag’s Head and much has changed. It’s more built up. And I have children. But I am looking forward to spending a lot of time on the deck, watching the sun rise and set, and more time on the beach staring at the breakers as they roll in. Depending on connectivity issues, posts may be spotty or non-existent. But who knows? That’s the beauty of vacation, no matter where you travel. I’ll try to send a post card. 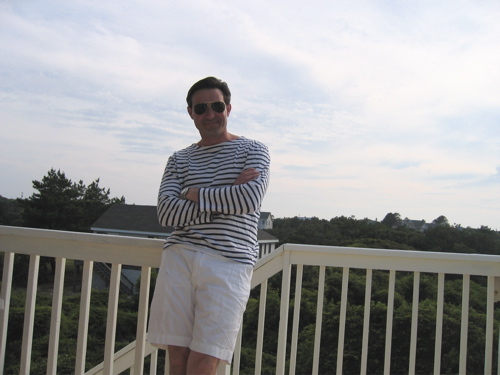 This entry was posted in Living and tagged Nag's Head, North Carolina, OBX, Polo Ralph Lauren, Ray Bans, St. James Shirts. Bookmark the permalink. What I your opinion are the smartest and best adapted beach shoes? Especially for sandy beaches. Velcro sandals, flip-flops are inacceptable foar anyone who is not an 18 yr old bikini beauty, sneakers are inappropriate as they get smelly, boat shoes are not very confortable when the sand gets in …. In my opinion the easiest and most elegant solution are French or Spanish “Espadrilles” in dark blue. Did you come along any better solution? Espadrilles are my best solution. Especially as they retail rd 5-10 Euros in any supermarket before the summer here in France. Hello Matylee, I love espadrilles from both France and Spain. Here in America, they are viewed as somewhat suspect when worn by men. That doesn’t stop me, but it gives some pause. Of course they cost us much more as they are imported. Most cost in the USD$50 range, which is ridiculous. I stock up when I am overseas. On the way to the beach here I usually wear flipflops (the aforementioned REEFs) and take them off as soon as I walk onto the sand. Canvas tennis shoes work well, as you can throw them in the wash. But on the sand or on deck, barefoot almost always wins out for me.